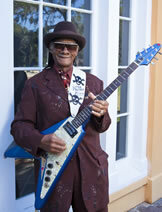 On January 20, 2012, at the age of 72, Little Freddie King was featured as a musician on the soundtrack of a major motion picture. His recording of “Cleo’s Back” in Extremely Loud & Incredibly Close perfectly captured the sorrowful beauty that earned the film an Oscar nomination. The soundtrack added to the still-growing evidence that, for this musician of almost 60 years, demand has never been higher. It seems that America has finally caught up with Freddie, largely due to his perseverance and integrity as an artist. As a teenager, he began experimenting with guitar music, combining elements of country blues and urban R&B into the unique style we know today. Freddie has long enjoyed a loyal international fan base, and he remains a major attraction at music festivals in Europe and South America. There were many times when Freddie could have modified his music to please a wider American audience. But his fusion of authentic Mississippi Delta blues and New Orleans sounds has become part of his very being, and to change it would mean changing himself. His growing fan base applauds the fact that Freddie stayed true to himself. In essence, they learned to appreciate him, rather than Freddie adapting to them. From the time he first hopped a train to the big city, through his widely celebrated career as a bluesman, Freddie went through very tough times. But he never gave up on his dream. He recognized what was truly important and worth sacrificing for, and he stuck with it. That kind of fortitude can only come with maturity – through establishing and nurturing personal values. Freddie never wavered on what he knew was right, and he is now realizing the benefits of his conviction. Little Freddie King… Peoples Health Champion.